Scenario: I want to move all my data to a new machine. I was thinking about simply imaging the HD from my old machine to the new machine. I know that there are some things like video drivers that I'll have to update, but does the system need to have the exact same type of CPU as well or will Windows detect hardware changes after booting? The OS in questions is Windows XP Professional, Volume License (so at least it shouldn't need any reactivation due to hardware changes). Re: When Imaging to New Machine, How Alike Do Systems Need to Be? I think it could be done if you run sysprep first. 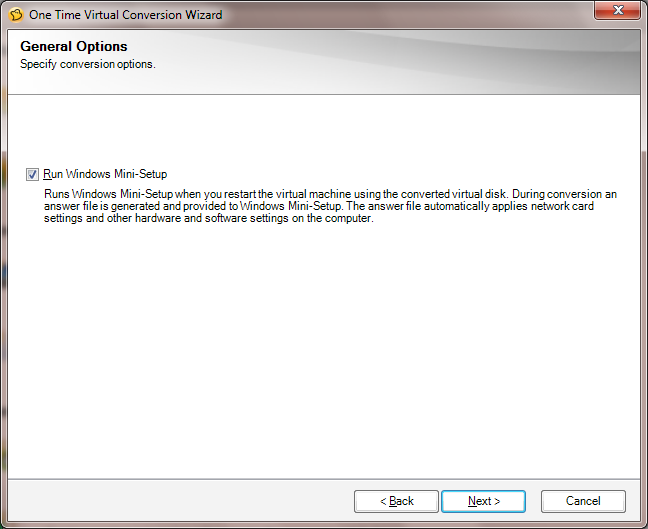 Or I have noticed that if you use Ghost 15 and do a "One Time Virtual Conversion" from the Ghost v2i file to a vhd file, it asks if you want to run a "Windows Mini-Setup". I played around with this on a Windows XP Home back up and was able to open the image in Virtual PC. It seemed to work fine except my version of Windows required activation in 3 days. All of the software worked fine. I would imagine that you would have some tweaking to do but I think it would be worth a try. According to the Ghost 15 help file you can recover from a vhd file in the recovery environment so I think it will work. Here is that checkbox I was talking about.. Excellent - I'll give that a try. Thank you! It does sysprep the drive when you do the conversion. It seems like a lot of work but redk9258 is correct, if you do the conversion and then image the VM before the first boot you will have a syspreped image ready to go. Instead of it redetecting the virtual hadware it will be doing it's thing on another system. If your familiar with sysprep it would be easier to do that instead but working off an image wouldn't make any changes to the original system. The main problems in restoring a system on disimilar hardware would be the Hal and the hard drive drivers. If the Hal is going to be the same and both systems use SATA drives you might just want to go ahead and try the restore first and see what happens. It may just work and save you the trouble.